Today I am excited to share with you a site where you can get bibles, books, children's books and audio books with minimal effort on your part and no cost to you. Yes, FREE! My friend over at Bookworm Mama told me about Tyndale Rewards through Tyndale Publishing a little while back and I have gotten many items from them since for free! This is how it works. You sign up, and once you have an account, there are different ways to earn points. 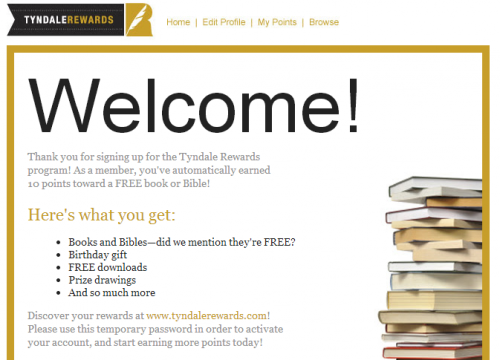 Every bible and book on the site has a points reward value. You can cash out your points earned at anytime you want or save them up. There are multiple ways to earn points like taking a quick survey, join their birthday club and sign up for the Tyndale newsletter to name a few. The best part is that it takes hardly anytime at all to get points and they add up fairly quickly! Below is just one of the items I got for my daughter and she loves it! She loves book just like her mama so this site has been great in collecting more for her. Why pay the in store prices for books when you can get them free?! Sign up today here if you are interested in at least learning more about it. I hope you will be able to enjoy this site as much as I have! Disclaimer: This is not a sponsored post. 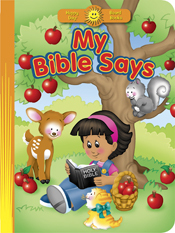 Tyndale is a Christian publishing house so the products you see on there will be religious. Absolutely! I am so glad you told me about it. Such good deals!